Looking for another adventure in life. Airphil Express offered a seat promotion as low as 288 pesos on a domestic destination. Bacolod,Butuan,Cagayan de Oro, Caticlan, Cotabato, Davao, Dipolog, General Santos City, Iloilo, Kalibo, Legazpi, Ozamiz, Pagadian, Puerto Princesa, Surigao, Tacloban, Zamboanga. Cebu, Davao, Kalibo, Puerto Princesa. 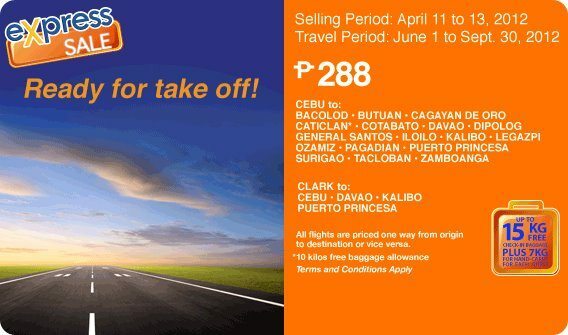 Booking Period: April 11-13, 2012 or until seats last.